The business end of the World Cup is well and truly underway, with one slip in the knockout rounds holding the possibility between crucial progression and a disappointing flight home. As everyone’s gaze focuses straight ahead however, Oddschecker have been busy looking back at the last fortnight of football, which saw an exciting group stage of 48 games have 122 goals plundered, coming out at 2.54 goals per game (4.9 per cent down on Brazil’s 2014 entry). An unprecedented nine own goals have also been conceded, with the controversial addition of VAR seeing the awarding of 24 penalties, six of which were missed, with the technology labelled as “costing bookies dearly”. A usual 0.2 penalty incident rate is standing at 0.5 in Russia thus far, with half of games having a penalty on average “what started as a 3/1 shot pre-tournament is now regularly priced nearer 6/4”. South Korea’s shock 2-0 win over defending champions Germany eclipses Switzerland’s 16/1 upset of Spain eight years ago, with Betfair sportsbook available at 20/1 at kick off. 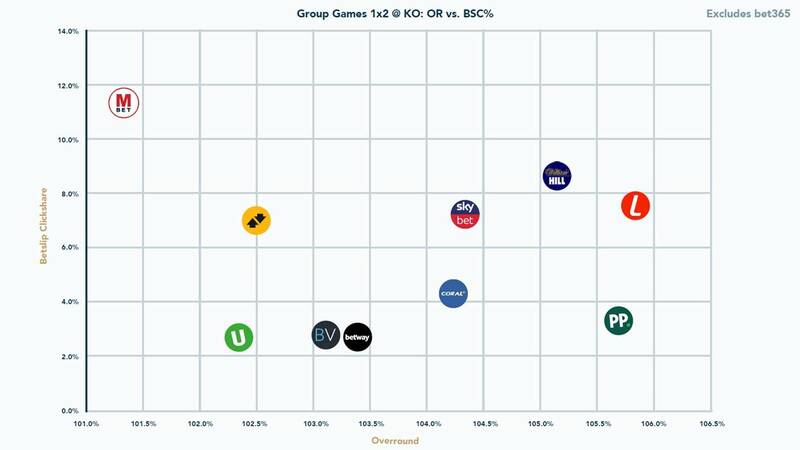 Betfair has been praised as having “offered the lowest overrounds (1×2) on average on pre-match match odds markets since the start of the tournament,” with Marathonbet also receiving a special mention, for being “the tightest priced 1×2 sportsbook of all of Oddschecker’s partners” (illustrated on the below graph), continuing its Premier League form. The graph illustrating price vs clicks performance excludes bet365, who enjoyed a clickshare of 28 per cent and tournament-to-date OR of 102.7%. Oddschecker also states operators pricing for the World Cup is more aggressive than the previous season, whilst bookies have also “enjoyed a relatively favourable tournament,” despite there being just one goalless draw, as opposed to five in the last three group stages. Thus far 58 per cent of games have been won by the favourite, and 15 per cent a draw, with the Oddschecker roundup concluded with English hopes: “Bookies will be hoping England progress through the tournament, but are likely to be reluctant to cheer us all the way home. Group of companies Kindred announced about successful purchase of online bookmaker 32Red for 219 million dollars.